On November 8th, 2013, the people of the Philippines were struck by the most powerful tropical cyclone to ever hit land. Typhoon Haiyan, or Yolanda as the locals call it, ripped through the Eastern Visayas Islands, destroying or damaging nearly every standing structure in some areas as the wind pulled a typical house apart piece by piece. In the village of Batug, a sleepy community subsisting on the local coconut industry, most people’s homes were simply blown into the jungle. Three months later, I traveled to the Philippines to be part of a rebuilding mission led by Michael Reynolds and his Earthship Biotecture crew from Taos, New Mexico. For the past four decades, Reynolds has been among the most innovative architects on the planet. Building with mostly recycled materials, his Earthships produce their own energy, harvest their own water, treat their own sewage, and heat and cool themselves without fuel. They can also be relied upon to grow a considerable amount of food inside the home, year-round, in any weather. It may sound too good to be true, but some Earthships have already been operational for more than twenty years. 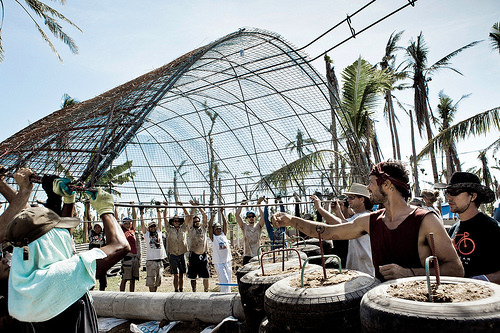 Inspired by the destruction of Typhoon Yolanda, Reynolds’ mission in the Philippines was to build the prototype of what he dubbed the Windship – an aerodynamic evolution of the Earthship intended to withstand the ferocity of another superstorm. From February 23rd to March 4th, Reynolds was joined by his crew, the people of Batug, and a group of over forty international volunteers to help turn the Windship concept into a fully-functional community center. Once I returned to Seattle (and recovered from jetlag, exhaustion, and some mysterious tropical bug), I began to transcribe the many interviews I had conducted in the Philippines. The intention was to use these interviews for research and an occasional quote in an extended feature article that I have begun writing. But as I typed up the responses of the local villagers, the Earthship crew, and my fellow volunteers, I realized that the interviews themselves were a veritable treasure trove of insight and inspiration. So in the spirit of what this project was about, I’d like to share these with everyone, beginning with a group interview of Michael Reynolds. This initial wave will consist of four parts, but expect another four or so to trickle in over the next couple weeks. Thank you to everyone who participated, and thank you Federica for the fantastic photos!